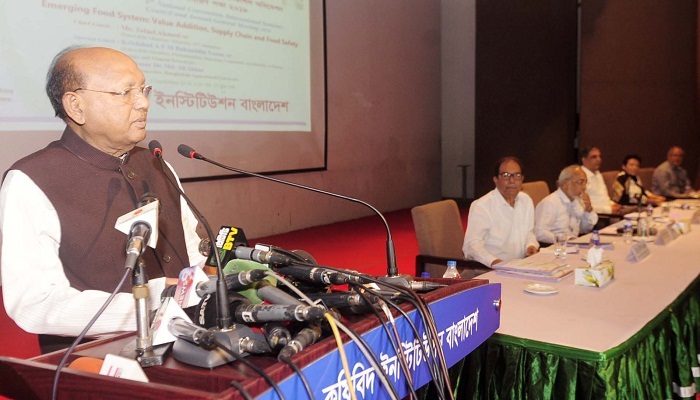 Commerce Minister Tofail Ahmed on Sunday said the government has imposed 28 percent import duty on agricultural items to ensure proper price of locally produced products and protect the interest of farmers. The minister was speaking as the chief guest at a seminar on “Emerging Food System: Value Addition, Supply Chain and Food Safety” organized on the second day of the 6th National Convention in city’s Krishibid Institution. He said: “Duty was lifted for a while for importing food grains due to temporary difficulties created by flood, but 28 percent duty has been imposed again to protect the interest of local farmers. In fiscal 2017-18, the country produced a total of 407.14 metric tons of food grains. With Vice Chancellor of Bangladesh Agriculture University Professor Dr M Ali Akbar in the chair, Dr S P Gupta, former Vice Chancellor of Khulna University, Dr Saifuddin Shah and Dr Katinko D Balag presented subject-based keynote papers. Agriculturist AFM Bahauddin Nasim spoke on the occasion as the special guest.